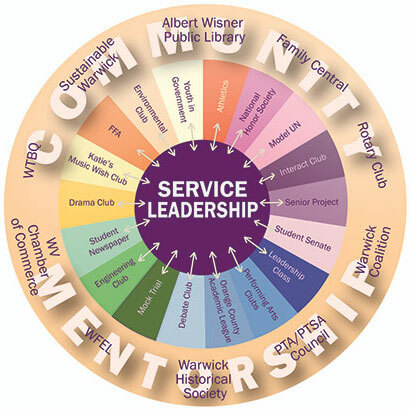 The Warwick Valley Central School District provides students at all levels with a variety of leadership opportunities, through clubs, programs and classroom activities that hone their leadership skills. This confidence-building foundation is one students can build upon in college and beyond. WVCSD offers more than 40 student clubs and 42 athletic teams (from modified- to varsity-level) to help students discover and follow their passions – many providing opportunities for students to impact their world with meaningful community service, which fosters service leadership. There are options everywhere, with something for everyone, including LEGOS and chess, environmental stewardship, performing arts, athletics, student government, STEM-focused clubs, history and literature, and many more. At the elementary school level, even the youngest students take responsibility for helping others. Kindergartners help their classmates with reading, writing and projects. There are Green Team and Green Cub club leaders, responsible for making sure we separate recyclables from classroom waste, among other conservation activities, and fourth graders are assigned Kindergarten “buddies”. At Park Avenue Elementary School, some of the more involved and organized leadership opportunities come through membership in Student Council. Student Council members have significant roles in school-wide initiatives such as No Name Calling Week, the Veterans Day Celebration in the fall, and toy, clothing and food drives throughout the year. They also assist with special events such as the recent Valentine’s Dance for senior citizens and the play for Park Avenue’s ‘One Book, One School’ read. At Sanfordville Elementary, students have an opportunity to learn leadership skills through the PTA enrichment class “Be a Leader,” where students learn the five practices of leadership, based on the Student Leadership Challenge Experience. From this course, a Leadership Club for third and fourth graders will be established at the school this spring. The club will work on one or two service projects a year to complete together as a team with help from the entire building. Some Sanfordville classes employ ‘table captains,’ whose job it is to critique the performance of their collaborative groups and book clubs using rubrics and providing positive feedback. Music classes at Sanfordville manifest leadership skills, as each section has a section leader and an assistant responsible for handing out and collecting materials, who also must be on top of their parts – training for further advancement through the music program where there are auditions for this honor. High school students are encouraged to lead in a variety of ways – both elected and non-elected leadership positions. From team captains to class officers, along with student governance in musical ensembles, and officers for all clubs, student leaders play an integral part in the everyday operation of programs at Warwick Valley High School. Recently, five students from the high school’s new Leadership Academy class sat down to discuss leadership. 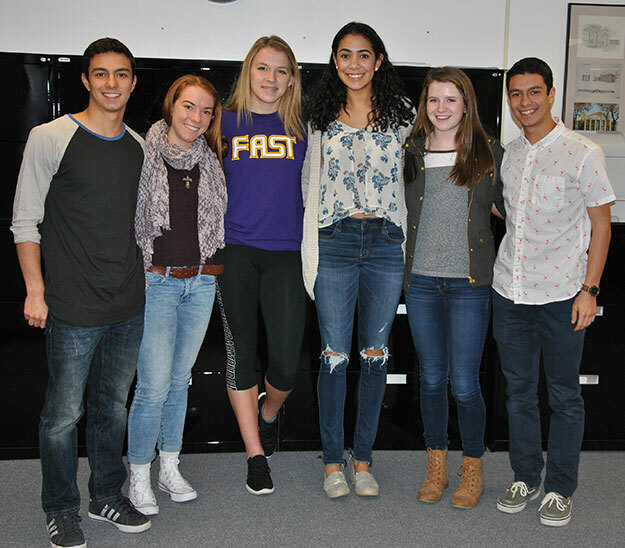 These students, Jennie Prial, Brogan Dineen, Emily Welling, Demi Herasme, and Jason and Thomas Nafash, spoke broadly about the various leadership opportunities at Warwick Valley High School, but also about their individual experiences. Looking back on your early years here in the school district, do you recall some of the leadership opportunities you had in elementary and middle school? The students all agreed that at the elementary and middle school levels, while the leadership opportunities may not have been so obvious to them at the time, looking back they acknowledge there were always small projects or classroom responsibilities that gave everyone a chance to help, supervise or positively influence their peers. Jennie: Teachers had us taking turns to do different things in the classroom, whether it was clean-up duty or leading a project. What opportunities have you had to perform community service? Emily: There are always opportunities to do community service. Student Senate does clothing drives, food drives and blood drives. As part of the Leadership Academy, we choose a service project in the fall and work on it throughout the year. Jason: Jennie and I are doing a reading project for second-graders. On a regular basis, we go down to the elementary schools to read to second-graders. Demi: Emily and I chose to fundraise for the Make-A-Wish Foundation this year. We’ve had a basketball tournament to raise funds, and hope to raise $7,500 in total, which is what it costs to make one wish come true for a child with cancer. If we make the amount for a wish, we’ll get to meet the child and find out what his or her wish is. Brogan: I’m working with one of my classmates to organize a midnight run with St. Stephens. We’re helping the youth group there with plans to collect clothing and toiletries to bring to the homeless in New York City sometime in mid-March. Thomas: My friend Jack and I are fundraising for the Tom Coughlin Jay Fund – which helps families in the tristate area tackle childhood cancer. We ran a ‘Pass, Punt and Kick’ fundraiser in the fall, and a silent auction during homecoming. So far we’ve raised $350 – we’re hoping to reach $1,000 by the end of the school year. Do any of you attribute your high personal productivity and confidence levels to your leadership experiences at school? Jennie: I think that, rather than leadership class or other leadership opportunities making me more productive, I think I’m just a naturally productive person. But Leadership class has given me more well-rounded sets of skills – some as simple as responding in a timely manner to emails. Simple, but important. Emily: I’ve gained a lot of confidence during this class because it forces you to do things outside your comfort zone. We have guest speakers in the class, and it’s the students who contact and arrange for the speakers to come in. I contacted someone from Make-A-Wish to come in and speak to the class – it wasn’t anyone I already knew – I just had to call and ask. This can actually be uncomfortable for students – it makes you vulnerable to rejection. Guest speakers lined up by Leadership Academy students this year were: Mr. Gonzales from Make-A-Wish; Warwick Town Supervisor Michael Sweeton; Jan Brunkhorst from Beautiful People; best-selling author Jim Defelice; Mr. Phil Royle, Project Manager for LEGO Land; school administrators Dr. Leach, Mr. Yap, Dr. Washington and Mr. Sirico; Secret Service Special Agent Kent McCarthy; New York State Assemblymen Karl Brabenec and James Skoufis; the Athletic Director of Goshen Schools, Greg Voloshin; Warwick Town Judge Jeanine Wadeson; former school superintendent Ken Mitchell; Warwick School Board President Lynn Lillian; Vice President of Community & Corporate Relations for the NY Giants, Allison Stangeby; Purple Heart recipient and WVHS teacher Eduardo Avila; the founder of Sustainable Warwick, Bob McGrath; Lt. Daniel Prial, USMA, helicopter pilot, Iraq; Holocaust survivor Aviva Cohen; New York State Comptroller Mr. Thomas DeNapoli, TJ Asprea, Director of CBS Evening News and Warwick Alumnus, and; New York State Senator John Bonacic. What opportunities have you had to attend leadership conferences or meet with leadership students from outside Warwick? Brogan: Jason and I went to the LEAD Conference in Washington, D.C. last year. A different group went this year. Jason: It was a great experience because of the excellent speakers and workshops. Brogan: We got different perspectives from diverse groups of students from all over the country. It made us realize all of the opportunities we have here in Warwick, whereas students in other parts of the country don’t have nearly as many. I met a girl from the state of Florida, who doesn’t have Student Senate at her school. So she had to fight to convince school administrators and her teacher to attend the conference. It was a really big deal for her. Do you consider any of your teachers or other adults in your life to be role models? Demi: Leadership class students just recently had to consider this question. We were asked to write a “Gratitude Letter” to someone in the District who helped them or who they looked up to. I wrote to former teacher Mr. Sattler. We invited all the letter recipients to an upcoming reception in their honor here at school. Since all of you participate in school sports, can you also talk about how sports in Warwick help bring out the leadership abilities in students? Jennie, Cross Country Track and Basketball: In Warwick, your team is like your family – you look out for one another. Being on a Warwick team shows you how to be a leader by caring for your teammates. You naturally take on the responsibility of helping and showing the ropes to younger teammates. Thomas, Track and Field: With track in Warwick, everyone is a leader and displays their personal leadership because of tradition. The tradition of excellence, discipline, achievement. The coaches tell you that just because others before us achieved a lot and were the best of the best doesn’t mean we’ll automatically get that too. We all need to do our jobs and put in the effort – nothing is given to us, we have to earn it. Demi and Emily, Basketball: On the basketball team, we definitely have the teamwork mindset and determination. We’re in it for each other, not for individual stats and glory. Emily: We vote for a captain of the team, and what we look for in that person is confidence and good sportsmanship. Brogan, Lacrosse: We’re not having team captains this year. We’re hoping the natural leaders on the team will emerge, and it also means everyone really has to step up and be ‘captain-like’. Mr. Burns also spoke about the superintendent’s commitment to creating new opportunities for Warwick students. “Dr. Leach is looking to provide many opportunities for students in all areas, not just this one class. He’s willing to take time to discuss different opportunities and to try new things,” Mr. Burns added. Model United Nations, or Model UN, is a new extracurricular activity at Warwick Valley High School. The club, led by high school teachers Gene Burns and Brian Nelson, is a simulation of the diplomacy and international relations that take place at the United Nations, where students learn and practice the skills of an actual UN delegate – research, public speaking, debating, critical thinking, and team work. Clubs from all over the United States (and the world) attend conferences, where participants (delegates) are placed in committees and assigned countries. Delegates conduct research on pre-assigned topics and debate their positions, staying true to the actual position of the member they represent. Model UN fosters negotiation, speaking and communication skills necessary for leaders in many different fields. Some notable individuals who belonged to Model UN clubs in their youth include U.S. Supreme Court Justice Stephen Breyer, actor Samuel L. Jackson and former Secretary-General Ban Ki-moon. Interact Club at the high school, led by teacher Jeanine Fogler, is another opportunity for students to enhance their service leadership skills. Interact is a service club sponsored by Rotary International. Rotary Clubs provide support and guidance, but Interact is self-governing and self-supporting. By working on community service projects, club members acquire networking skills as they interact with local and international organizations. Students learn the importance of developing leadership skills, personal integrity, helpfulness and respect for others. “As part of Interact, students work with the broader community on a daily basis,” said Mrs. Fogler. “Although there are some national and international service projects, there is really so much the students do locally to benefit our own community,” Mrs. Fogler said. Some of the club’s major initiatives are the holiday food drives, and work with the local food pantry and Rotary Club throughout the year. Interact members also make regular visits to Mount Alverno, where they engage the residents in different activities. The students now have ties to the local creative non-profit, Wickham Works. Doug Torgersen teaches Financial Literacy at the high school, where he sees students gain the confidence necessary for success after high school as they learn real-world skills about finances. “Taking charge of one’s financial future can improve every aspect of their lives,” says Mr. Torgersen. “All good decision-makers, and leaders for that matter, use the same basic tools.” Students in the Financial Literacy course have the opportunity to acquire these tools and the knowledge and skills necessary to make good choices. “I think this quote by CEO Lisa Cash Hanson sums up the goals of the course: ‘Leadership is the ability to guide others without force into a direction or decision that leaves them still feeling empowered and accomplished.’ With self-discipline, the techniques and tools I teach the students in this course can ultimately change their lives and the lives of others,” says Mr. Torgersen.